Situated in the told part of the city, the Grote Markt is a hub for social life. There is a happy buzz in the air. Nearby, people dine at an outdoor cafe. The ground is covered in flowers of every color being sold at a market. The buildings encompassing the open square, such as the Hôtel de Ville (Town Hall), are pure archaeological elegance. Honestly, I was utterly perplexed as to why this little baby statue is so famous. There was a huge crowd gathered around the fountain and I had to push my way through to the front just to see what all the fuss was about. A peeing baby, dressed in uniform. "Over time it has become a tradition for visiting heads of state to donate miniature versions of their national costume for the little naked boy. The wardrobe of Mannekin Pis can be seen at the Brussels museum and includes over 760 outfits – even an authentic Elvis jumpsuit." After basking in the greatness of the fountain - just kidding - grab a waffle nearby. With all the delicious smells nearby, it is impossible to resist. Some were sprinkled with powdered sugar, others with bananas and Nutella. I picked the one topped with fruit and melted chocolate. As I bit in to my waffle, the caramelized edges cracked and my mouth went straight to heaven. I needed all those napkins to wipe up my face of chocolate afterwards. The Atomium, which represents a molecule, was made for the World Fair in 1958. It's quite huge - the nine spheres are linked by escalators. Unfortunately, we ran out of time to go inside and experience it's magnificent views over the city. It is also right next to a theme park, Mini Europe, for anyone out there with children. 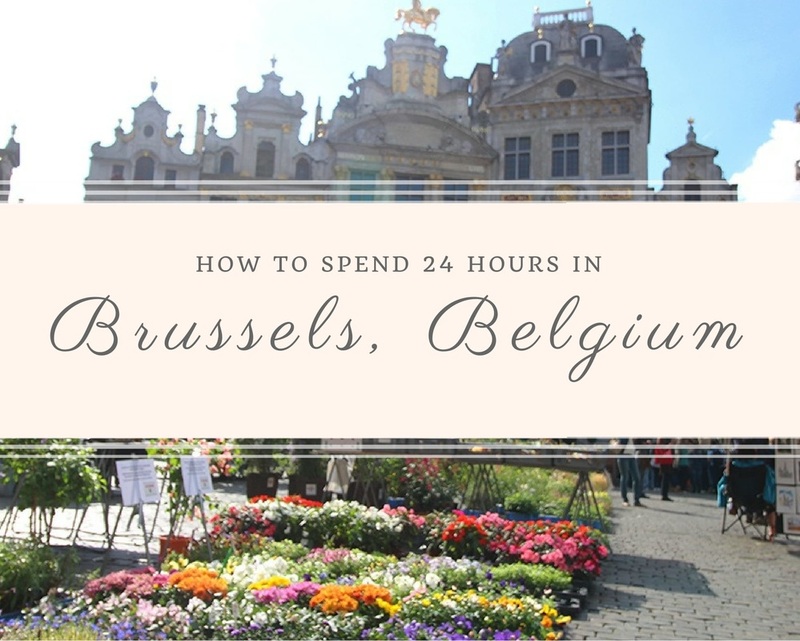 Stroll through Europe's original covered shopping gallery, home to a Godiva store, a Häagen-Dazs cafe, and many other chocolate shops, maracon shops, and traditional Belgium trinket stores. If you're anything like me, you'll want to carve out a few hours here to walk through each and every chocolate store just to see all the flavors and shapes and prices before finally buying something. I can't understand why anyone would truly like beer. I just hate the stuff. No matter how wonderful Belgian beer is, I wasn't buying it only to have one unpleasant sip and throw the rest in the trash. Instead, I opted for a Belgian coffee - a blend of black coffee, Cointreau, and whip cream on top. Around the city center, there are comic book murals painted onto the sides of buildings. These works of art were commissioned by the city. Each mural has a little map nearby to help direct you to the next one. Beautifully put! Love the pictures and the Belgian Waffle is just too much. I will go to Belgium just for that waffle. Wow, it's so beautiful there. Now I'm craving Belgian waffles! Wow! These pictures are getting me super excited for my trip to Vienna in May (because of the chocolate & beer you mentioned), but I think Brussels will need to be my next European adventure. It looks so lovely. Great post! I only had a short afternoon in Brussels - not nearly enough time to see all this beautiful town has to offer! The Atomium looks like the coolest thing ever, lol. I think it would be so fun to go up in that and be able to look out at what's around it. The comic murals, looked like fun too.